Dear Mr. Little: Gosh! Who would have thought that losing weight and getting more fit could bring such special attention! It so wonderful that someone cares about what I went through to shed those 30- pounds. I hope my story will encourage others to take the “plunge”. I have filled out, signed, and had Gloria Perea sign as Witness the Testimonial Release forms and the Exercise Equipment and Weight Loss Questionnaires. I was stumped as to what to do about finding some clearer “before” pictures. Like I said in a previous letter, I usually dodge the camera as much as possible. But while I was working on a graphics project for the school where I work, I stumbled across two pictures that were taken when our previous Principal retired. Not only was I shocked, but so was everyone at work. Then didn’t realize how heavy and “round” I was then. I hope these will be more useful. I tell everyone, I love my Gazelle. 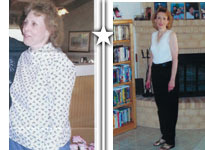 I recently went into your web site and saw many of the testimonials and pictures. I also finally got to read in detail about your horrible accidents and your recoveries. You are to be commended! I am thankful that God laid it on your heart to help people like me. Well, I need to sign off here -.it’s almost 6 P. M. and time to get on my Gazelle! Thanks so much, Thyra - El Paso, TX.